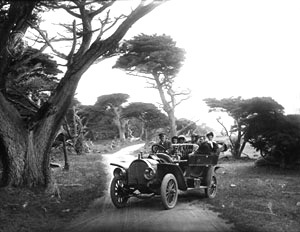 Historic Photo of Touring Car on the 17 Mile Drive in Pebble Beach, Monterey, Cal. This photo by C. K. Tuttle shows a Royal Tourist touring car model G3 at Cypress Grove in Pebble Beach (along 17-Mile Drive). This print is from an 6½x8½ inch glass negative. Samuel F. B. Morse (September 18, 1885- May 10, 1969) was the "Duke of Del Monte" forming the Del Monte Properties Co. in 1919 by buying the P. I. Co. land on the Monterey Peninsula. This image is also available in a 4x6 Sepia postcard. 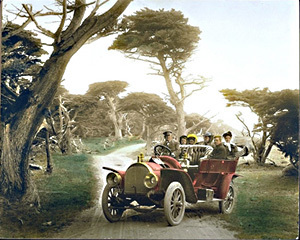 Here is a hand colored photo by Pat Hathaway The 17 Mile Drive began in the early 1880's by the Pacific Improvement Company a subsidiary of the Southern Pacific Co. as a route for horse-drawn and later touring car's excursions for tourists at the Hotel del Monte to the original log Lodge in the Del Monte Forest at the time it was only a lunch stop along the shores of Carmel Bay. The 17 Mile Drive was the round trip from the Hotel del Monte to the Lodge and back to the Hotel. We also have photos of the original log Lodge and Jung San Choy Chinese fishing village at Stillwater Cove and early photos of golfing at Pebble Beach from the 1929 U.S. Men's Amateur and the Bing Crosby's golf tournament from 1947 to the 1960's. Holdings: over 1,685 photos of Pebble Beach from 1880 to today.